Over the past two years, Green Charge Networks and Stem have been racing each other for the title of top behind-the-meter battery startup -- and for funding to back their no-money-down deals for customers. On Thursday, Green Charge announced its latest step -- a non-recourse debt financing of $20 million in planned projects, and another $30 million awaiting new projects in 2016. Non-recourse debt is the primary financing method for large-scale energy projects, including most solar energy projects. It also carries a higher risk to the lender, since it is secured only by the collateral of the projects it funds, not the borrower’s corporate assets, and relies on ongoing revenues to pay back the lender. That’s made it a rarity for the energy storage industry, which hasn’t yet built up the real-world track record and performance data that solar has. In November, developer RES Americas completed a utility-scale battery project financed by non-recourse debt. 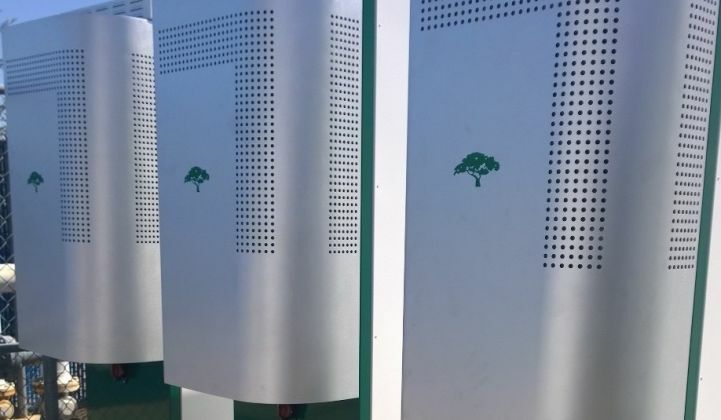 Green Charge CEO Vic Shao said in a Wednesday interview that it's the first such financing for behind-the-meter energy storage. UPDATE: Stem told us on Thursday that its entire $135 million raised for project financing consists of non-recourse debt, including $100 million from B Asset Manager in 2014. "Stem was the first behind-the-meter company to offer this kind of project financing more than two years ago," Prakesh Patel, Stem's vice president of capital markets and strategy, said in a statement. “That’s the operative phrase here,” he added. Over the past few years, solar companies SolarCity, Sunrun and AES Distributed Energy have pooled debt-financed distributed solar projects into asset-backed securities. Green Charge is looking at similar opportunities to tap investor dollars, he said. Behind-the-meter batteries like those that Green Charge installs and manages earn their keep by helping commercial and industrial customers reduce their demand charges, by injecting power to reduce the portion of a commercial customer’s utility bills based on peaks in electricity consumption. That’s a far more complicated calculation than simply metering a solar panel’s output, and requires some heavy analysis and prediction of building loads and peaks. That's important both to identify which customers are worth targeting, and then to make sure the batteries catch every single spike in demand, to avoid erasing that month's cost savings in an instant. But Green Charge and Stem -- its primary rival now that contender Coda Energy has gone bankrupt -- are pledging that their software can provide the clarity and predictability that investors demand. Both are also working on aggregating their “fleets” of battery-backed buildings to earn additional revenue streams, whether through providing demand response, bidding into grid services markets, or in Stem’s case, meeting utility capacity requirements. To date, behind-the-meter batteries have been almost entirely deployed in California, a state which combines relatively high electricity costs and demand charges with an incentive program that can cover more than half the cost of qualifying energy storage systems. But Green Charge is also working in New York, another state with high demand charges and incentives, and in Hawaii, a high-cost electricity state and a hotbed for battery-backed solar projects.